Seasoned Mom Hacks. 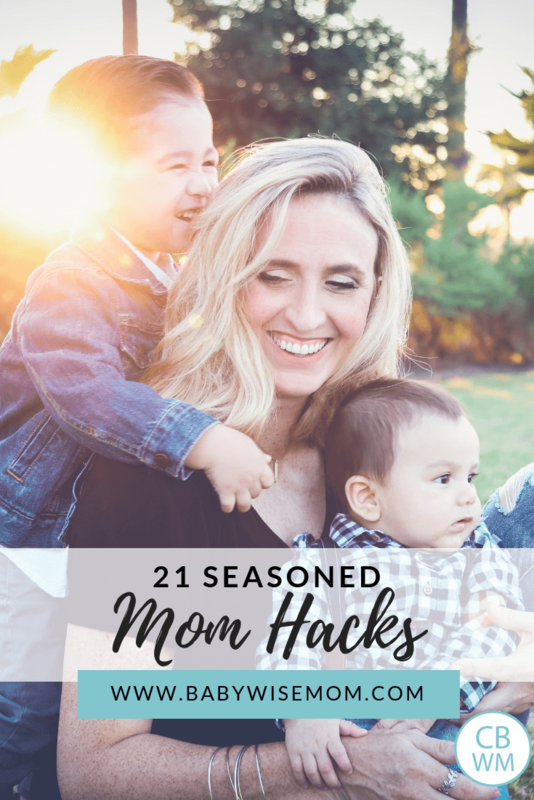 Twenty-one parenting hacks and tips to help make it easier for you to manage your family and rock motherhood. Experience can bring a lot of wisdom with it. While being a mom for a while doesn’t make all things easier, there are little tricks along the way you figure out that can all add up to life going a little smoother. 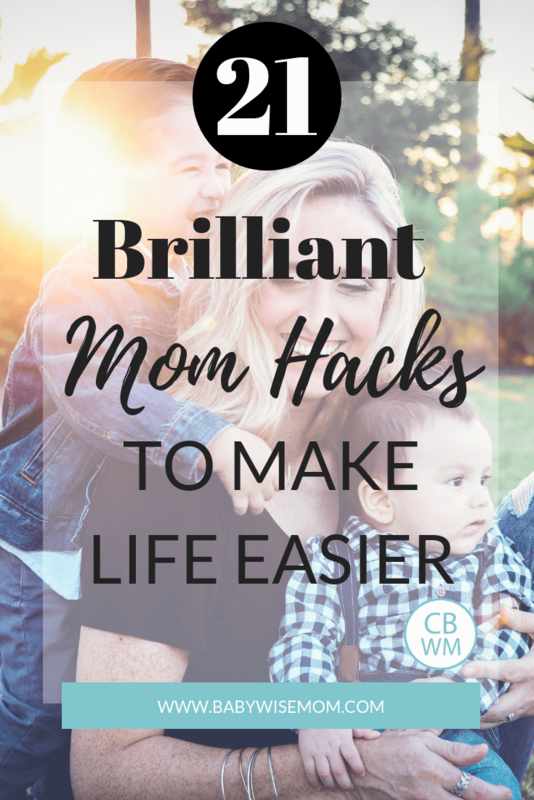 Here are some seasoned mom hacks to help you out. Before you go somewhere, talk with your children about your expectations. Talk with them about what they can expect. If you are headed to the park, talk to them before you go about how to respond when it is time to go. This isn’t guaranteed to prevent a meltdown when you say it is time to go, but it usually will. See my post Ask and Tell for a full rundown of how this works. Let them know what you will say and how they should respond. Let them know what consequences will be if those expectations aren’t met. Apply those consequences if expectations are not met. If you are headed to the dentist, tell your child what it will be like. Practice for the dentist at home before you go. Have your child lie on his/her back and you brush the teeth a few times before you go. Knowledge really is power. See Dentist Tips for Kids for more. When you are out and about running errands or even on a fun vacation but it is the end of a long day, distraction can be such a great friend to you. As your child to count five red things. As your child to tell you a word that starts with the letter I. Ask your child to find a square around him. Teach your child a fun little song. Ask what sound letters make. I used this tool as we walked the streets of New York City with my then five-year-old. It was magic. I wrote all about it in How To Easily Get Your Child To Do What You Say. I loved this school shopping tip from Rhianna. I will be using this next summer as we shop for school supplies! I like to shop early. That is is super handy and great, but it can be hard when it is time to get presents under the tree or in stockings and you can’t remember exactly what was for whom. I solved this by keeping a separate bag for each person’s stocking stuffers. As I buy something, I add it to the bag. I keep all of the bags in a box, which is up too high to reach. This helps keep things organized. It also prevents me from over-buying because I look in there every time I get a new gift. I can see when to stop. On the night, I get the bag, put it all in one stocking, and move to the next one. Brandy shared this about the dosage of medicine. If you like your sanity, just do yourself a favor and keep water in the car. Keep water in the car. Children do not realize they are thirsty until they are forced to sit still. They can play for hours and be fine. As soon as they have to sit for prayer, scriptures, a car ride…suddenly death is imminent! Water must happen now! Keep water in your car. We keep emergency water in the vehicle just in case we break down somewhere. I don’t break it out every time. But if we really just need some peace, I will break out the emergency water. I feel like that is a mental emergency. See what else I keep in my car here. When we take a road trip of even just 45 minutes or more, I tell my kids to pack a water bottle for the road. I don’t want to hear complaints about how thirsty they are. Bonus tip, do be sure to have potty happen before you leave if you are going to take water along with you. If you are wondering about kids drinking water, see this post Everything You Need To Know About Kids and Hydration. Again, if you like yourself, teach your child to puke in a bowl. The best time is when you have a child perfectly healthy. “If your tummy feels like it is going to throw up, hurry to the bathroom and you can throw up in the toilet. We can get you a bowl to throw up in. You want to make sure you always look down into the bowl. You don’t want to look to the side, no looking up, and no even looking straight ahead. Always into the bowl.” Then practice. “Great sharing problem solver my sister shared with me! Kid A has a toy that Kid B wants. Kid B asks for a turn and Kid A tells them how many minutes until they can have a turn (at 3yo the max is five minutes). This is GENIUS. Kid A doesn’t feel like they are being “forced” to share and Kid B knows when they will get a turn. We honestly don’t even need to set a timer usually because toddler minutes are so much shorter than real minutes. If you want your child to learn and grow, follow through. If a rule is broken, follow through. Even seasoned moms can forget to do this one, especially with the youngest child. You can make your life easier by making errands easier. Get grocery store pick-up or groceries delivered. Grocery shopping can be so hard with little ones, and so getting groceries delivered or even just being able to just pull up and get your order can make life so much easier. Shop online. Pay bills online or do automatic bill pay. Simplify what you can. ” We have a lot of kids (5) so one minor thing that has saved us time has been color coding water bottles. They always have the same one, same color, starting around 12-18mo. Just bought like 3 of the same and always know who left it out, who doesn’t have theirs, who left theirs in the car, etc. Never fighting over who gets which one. Fortunately for me, Brayden’s first blow-out happened when my sister-in-law was visiting from California. She was the mother to two. As I approached that diaper, covered in baby poop, I couldn’t imagine pulling it over my one-week-old’s head. She told me to pull the onesie down, not up. Do not go over the head, pull it down over the trunk and off the legs. Genius! No one wants to get poop on baby’s head. I love this tip from Kelly about children wanting to get toys at the store. I always tell Brinley to put anything she wants on her list. It does work! “Telling children (from the time they are toddlers) to “put it on your birthday/Christmas list” every time they show you something they like at the store. Then NEVER buy them anything while they’re shopping with you. Self-care is a hot topic right now. You have heard it. You cannot take water from an empty well. You have to take care of yourself as a mother. It is good for you and your children for you to have a moment to yourself each day. This post talks about how even just 20 minutes a day can make a positive difference in your day. Oh the timer can help you with so much! Independent play, discipline, manners, self-control, tracking video game time, getting chores done faster…I love the timer. See my post The Timer AND my post 10 Uses For a Timer That Will Make Parenting Easier. Your children will enjoy their toys so much more if there are times they don’t have the toy. A toy rotation can help keep toys fresh and kids interested in what they are playing with. See Out With the Old, in With the New (toys) for more. Little tips come with experience. 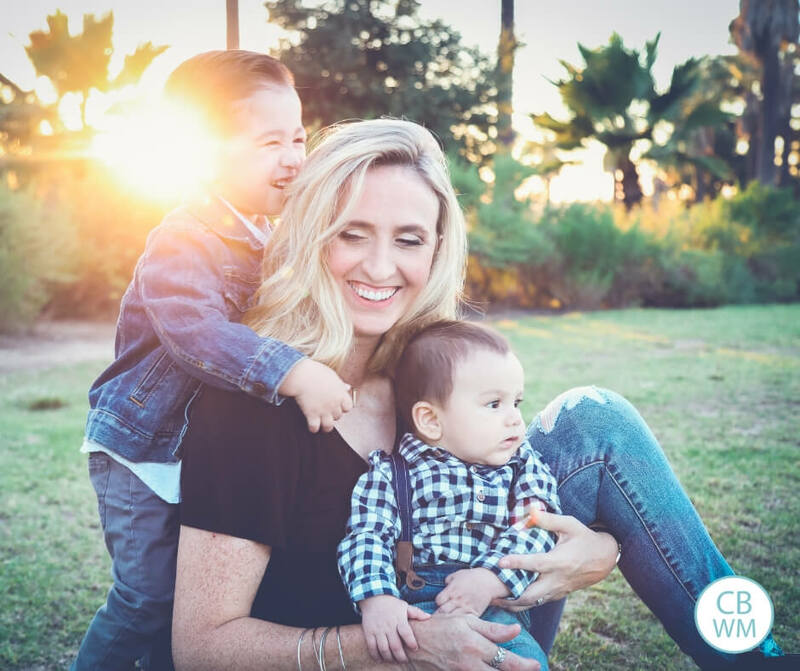 These tips can help you have an easier time with your motherhood journey. Find tips for having two little ones under two here: Two Under Two – 7 Tips for Keeping Everyone Alive and Sane.